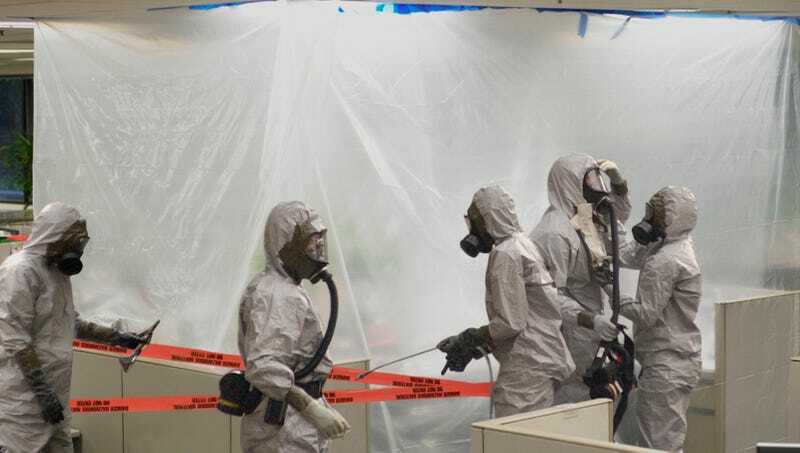 SAN FRANCISCO—In an effort to stop the spread of the dangerous negativity as quickly as possible, agents from the Department of Labor’s Emergency Response Team on Friday reportedly sealed off the toxic workplace environment at tech incubator Molloy Capital. “We’ve begun the hazardous but absolutely necessary task of cleaning up the site’s dangerous backbiting, unwanted sexual advances, and gross managerial incompetence,” said Labor Department special agent Angela Lasker, who noted that prior to their arrival, a steady stream of inappropriate comments had been seeping into the water-cooler conversation and were threatening to poison the entire company-wide intranet. “While we believe we’ve contained most of the professional and psychological damage, it’s still a very hostile, unsafe area. We honestly don’t think it will be able to sustain new hires for the foreseeable future, or at least until the pervasive low morale has had a chance to dissipate.” Lasker went on to say, however, that the communications department would likely never again be suitable for human employment.